To think the whole Apple vs. Samsung courtroom drama could have been avoided. Before the gavel was first banged in July 2011, Apple and Samsung met several times in 2010 in attempts to negotiate an agreement where Samsung could legally use the technologies and designs Apple has accused it of copying. As part of those talks, which took place between August and October 2010, Apple offered to license Samsung the technologies it said the South Korean company was illegally implementing in products like the Galaxy S smartphone. New court documents released Friday show the exact terms by which Apple extended a licensing agreement to Samsung, calling them a "strategic supplier" as it tried to subvert the seemingly inevitable trip to the courtroom. Had Samsung gone with the deal, Apple maintained it would have cost them $250 million (£1.59 million) in 2010, less than the amount Apple was paying Samsung for components at the time yet much less than the $2.5 billion (£1.59 billion) Apple is now seeking through the court. 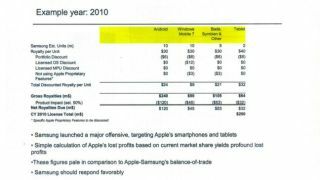 According to the documents, Apple approached Samsung in October 2010 with this deal: Samsung would pay a base rate of $30 (around £19) for each touchscreen phone sold and $40 (around £25) per tablet. That price would drop to by $10 (around £6) over two years. The deal would have included Android, Symbian and Bada smartphones, as well as Windows Phones. Figuring Samsung "should respond favorably," Apple also proposed a royalty discount structure that used the Windows Mobile-based Blackjack II as an example. The deal would've given Samsung an 80 percent discount overall, including a 20 percent cross-licensing agreement for Samsung's patents. This isn't the first time licensing has come up in year-old trial. TechRadar reported in July that Apple refused to negotiate 3G licensing agreements with Samsung. Somewhere along the way, the 2010 technology licensing talks broke down and now Apple is looking to get ahold of Samsung's profits an entirely different way.